When the body of a small-time crook named Mickey Parfitt washes up on the tide, no one grieves; far from it. But William Monk, commander of the River Police, is puzzled by the expensive silk cravat used to strangle Parfitt. How did this elegant scarf - whose original owner was obviously a man of substance - end up imbedded in the neck of a wharf rat who richly deserved his sordid end? Dockside informers lead Monk to what may be a partial answer - a floating palace of corruption on the Thames managed by Parfitt, where a captive band of half-starved boys is forced to perform vile acts for men willing to pay a high price for midnight pleasures. Although Monk and his fearless wife, Hester, would prefer to pin a medal on Parfitt's killer, duty leads them in another direction - to an unresolved crime from the past, to blackmail and more murder, and to a deadly confrontation with some of the empire's most respected men. 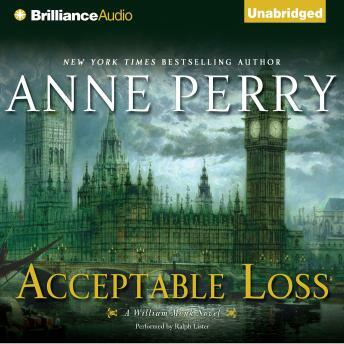 To a superlative degree, Acceptable Loss provides colorful characters, a memorable portrait of waterfront life, and a story that achieves its most thrilling moments in a transfixed London courtroom, where Monk faces his old friend Oliver Rathbone in a trial of nearly unbearable tension - in sum, every delectable drop of the rich pleasure that readers expect from an Anne Perry novel.